Still on the look for the perfect pontoon boat? Then this article is here to help. We know how hard it can be to decide on a boat – especially if it’s your first boat, and if you want to be 100% sure you made the right decision the moment you put your money down. The truth is that pontoons come in a variety of sizes, capacities, and purposes, and you want to consider all of these aspects (and many more) when making your choice. 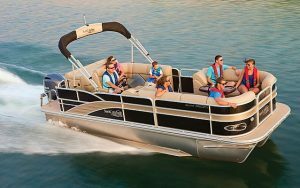 So, without further ado, what are the most important things to consider when choosing your first pontoon boat? 1. What do you plan to use the pontoon for? You might already know that some boat brands make their models or series with a specific activity in mind. For instance, fishing-oriented pontoons will usually come equipped with a fish finder and a trolling motor (you can technically buy both of those separately, but it will cost you an extra 1 to 2 grand.) Fishing pontoons might also come with fishing chairs on the front deck. Boats oriented towards water sports will usually have a more powerful engine and easy access from the deck into the water. And lastly, pontoons meant for social gatherings will usually feature a larger deck, lots of sitting space, and all sorts of extras like food storage and a sound system. 2. How many people will accompany you on the deck? This will directly influence your choice of deck size. If you only plan to have your wife and another couple of friends on board for a weekend out on the lake, a 16-19 feet deck is enough. If you plan to bring your kids and their friends along too, you should probably think bigger – up to 22 feet. Bigger pontoons (up to 15 feet) should be enough space to host up to 15 people, in case you were planning to be host extraordinaire. 3. How much are you ready to pay for it? A new pontoon boat with no frills and extras will start at about $15,000, but if you’re looking for something equipped with the bare minimum of necessities, you’re looking at around $25,000. Top-tier pontoons can cost up to $50,000, but that is mostly due to premium accessories and a more powerful motor, suitable for water sports. 4. What accessories do you need? Accessories are a very important aspect of owning a boat and enjoying sailing with it. If you did not splurge on a boat with all the accessories included, you’ll have to shop for seats, storage, flooring, electronics, and covers all by yourself. This might sound like a huge pain to some people, but if you enjoy customizing every single aspect of your boat, you might find that shopping for accessories yourself will turn out much more satisfying (and much cheaper) than getting a fully equipped boat. Lastly, you want to look for a reliable brand/seller to get your boat from. And by that, we mean one that offers 100% insurance for both replacements and labor on everything on your boat. While that will add a couple hundred to your bill, but at least you will be able to rest assured that the seller has got you covered in case something goes wrong woth your boat.